So you’ve heard about wine sorbet, that delicious adult dessert. But where do you buy it? You can’t order it online because it is frozen! So where do you get a frozen wine treat? There are wine slushies or smoothies that many wineries offer now. There are more like a milkshake made with wine. Wine sorbet is a frozen dessert that is made with wine as one of the ingredients and then frozen while in an ice cream making machine where it is whipped up while freezing. Your mouth can feel the ice crystals more than ice cream, but oh is it so delectable! 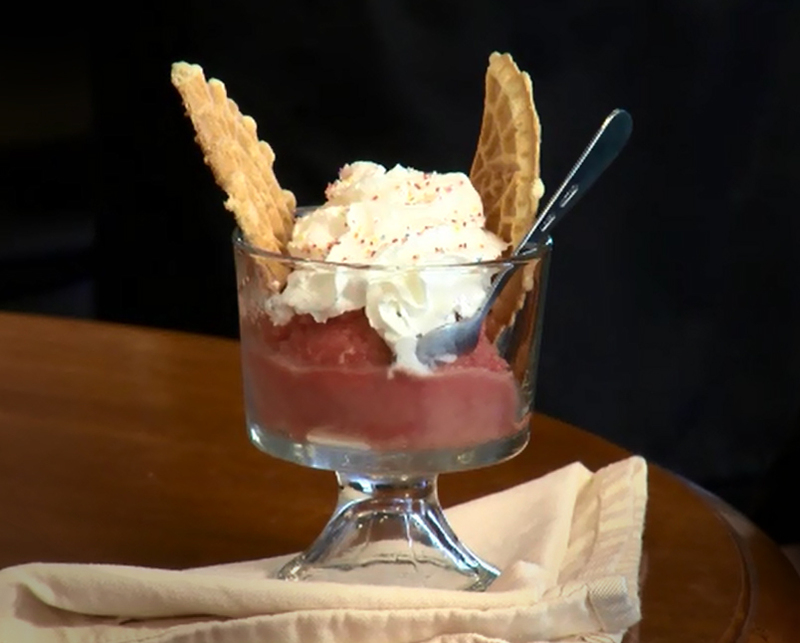 Deer Creek Winery makes its own frozen wine treat in their Delectable, Wine Sorbets! And they definitely are delectable. It’s always great having local, PA-made products, and when they can contain some other locally made ingredients, they’re especially great! If you haven’t tried all the flavors when you get to one their locations, ask for a sample! Lemon Riesling is so lemony, yet sweet. Your tongue will love the tingle! Deer Creek Raspberry has chunks of raspberry and tastes like it was just picked from the back field! Blackberry Buckle is reminiscent of Grandma’s delicious blackberry cobbler! Sassy Sangria is a frozen version of our popular Berry Wild Sangria wine! Peachy Shippenville Red is a wonderful blend of flavors dancing in your mouth! When you pick up your wine sorbet, be prepared. Sorbet, by it’s nature, melts quicker than ice cream so you have to have a plan to get it home when you go to the store. Take along a little cooler that has an ice pack in it or even an insulated lunch box if you’re just getting 1 pint. We’re warning you, though, 1 pint is usually NOT enough! Buy your wine sorbet on the last stop you make before going home so you can get it into a freezer ASAP. If the sorbet melts partially on your way home, stir it up well and put it in your freezer. It might not look the best after partially thawing, but it will still taste delectably good! Wow your friends at your next get-together and bring a bottle of Deer Creek wine and an accompanying wine Delectable sorbet! Only places that have an alcohol license can sell wine sorbets as it has 25% wine! Interested in stopping by the winery or any of our retail locations? See more here. Or does this blog make you crave one of our sorbets? Click here.